The Arhat, whose ego is working perfectly in the causal body, need not incarnate again in a physical body, and go through the wearisome round of birth and death, which is so unpleasant—at any rate, from the point of view of the ego himself. He must , however, descend as far as the astral plane. While in the astral body, he may at any moment that he chooses enjoy the nirvanic consciousness. If he is in the physical body, he can reach that nirvanic consciousness only when he leaves the body in sleep or trance,as already explained above. Nirvanic consciousness means consciousness anywhere in the solar system. The Fifth Initiation makes a man a Master, an Adept, a Superman. The Buddhists call Him the Asekha—literally, the not-disciple—because He has no more to learn, and has exhausted the possibilities of the human kingdoms of nature. The Hindus speak of Him as the Jivanmukhta, a liberated life, a free being, because His will is one with the Universal Will, that of the One without a second. He stands ever in the light of Nirvana, even in His waking consciousness, should He choose to remain on earth in a physical body. When out of that, He rises still higher into the Monadic plane, beyond not merely our words but our thought . As the Secret Doctrine expresses it: the Adept "begins his Samadhi on the Atmic plane," all planes below the atmic being one to Him. ( Page 317 ) A man attains Adeptship when he raises His ordinary consciousness to the nirvanic level: the fact that differentiates Him, and makes Him an Adept, is that He has unified the Monad with the ego. And, since He has become one with the Monad, He has already reached the level of the third or lowest manifestation of the Deity or Logos. In Christian symbolism, the Ascension and the Descent of the Holy Spirit stand for the attainment of Adeptship, for the Adept does ascend above humanity, beyond this earth, although, if He chooses, as did the Christ, He may return to teach and help. As He ascends, he becomes one with the Holy Spirit , and invariably the first thing He does, with His new power, is to pour it down upon His disciples, even as the Christ poured down tongues of fire upon the heads of His followers at the Feast of Pentecost. At the Asekha Initiation, the atma is seen as a clear light, a star, and, when it spreads out, at the last breaking down of the wall, it becomes the infinite light. Before that, the Arhat can feel the underlying peace of atma when in meditative mood, but constantly he returns to the sorrow. But when a man rises to the atmic plane in full consciousness, and the buddhic consciousness merges into that, there is but one light seen. This is expressed in The Voice of The Silence : "The Three that dwell in glory and in bliss ineffable, now in the world of Maya have lost their names. They have become one star, the fire that burns but scorches not, that fire which is the Upadhi of the flame." While the man was in the causal body, he saw the Sacred Three separate, but now he sees them as the three aspects of the triple atma. Buddhi and manas, which were "twins upon a line" in the buddhic consciousness of the previous stage, are now one with atma, the fire which is the vehicle of the Monadic flame. Then says the Teacher : "Where is thy individuality, Lanoo, where the Lanoo himself? It is the spark lost in the fire, the drop within the ocean, the ever present ray become the All and the eternal Radiance". ( Page 318 ) He who was a disciple is now a Master. He stands in the centre, and the triple Atma radiates from Him. The Adept has the power to get at any knowledge that He wants, almost in a moment. He can make Himself one with it, and get at the core of it instantly, and then observe the surrounding details as He may require them. Somewhere on the buddhic or nirvanic plane, He would grasp the idea that lies at the back for example, of any particular science or department of knowledge and make Himself one with that. Then, from that point of view, He would reach down into any details He might require. A Master does not appear to need all the knowledge stored within His brain as we do, but is able to turn a certain faculty on to anything that is wanted, and, by the use of that faculty, then and there, to know all about it. He would not need to read up a subject, but He would turn His all-seeing eye on the subject , and thereby somehow absorb the knowledge. This may be the explanation of getting rid of avidya - ignorance. With the buddhic faculty, as we have seen, it is no longer necessary to collect facts from outside, but one plunges into the consciousness of anything, whether it be mineral or plant or Deva, etc., and understands it from inside. H. P . Blavatsky has pointed out that a Master's physical body is a mere vehicle. It hands nothing on, but is simply a point of contact with the physical plane, a body kept as an instrument, needed for the work He does, and dropped when done with. The same consideration applies to the astral and mental bodies. The Masters aid, in countless ways, the progress of humanity. From the highest sphere, They shed down on all the world light and life, that may be taken up and assimilated, as freely as the sunshine, by all who are receptive enough to take it in. As the physical world lives by the life of God, focussed by the sun, so does the spiritual world live by that same Life, focussed by the Occult Hierarchy. Certain Masters are specially connected with religions, and use these religions as reservoirs, into which They pour spiritual energy, to be distributed to the faithful in each religion through the duly appointed "means of grace". Then there is the great intellectual work, wherein the Masters send out thoughts of a high intellectual power, to be caught up by men of genius, assimilated by them and given out to the world. On this level, also, They send out their wishes to Their disciples, notifying them of the tasks to which they should set their hands. In the lower mental world, the Masters generate the thought-forms which influence the concrete mind, and guide it along useful lines of activity in this world, and teach those who are living in the heavenly world. In the intermediate world, They undertake the work of the helping of the so-called dead, generally direct and supervise the teaching of the younger pupils, and send out aid in numberless cases of need. In the physical world, They watch the tendencies of events, correct and neutralise, so far as law permits, evil currents, constantly balance forces that work for and against evolution, strengthening the good and weakening the evil. They work also in conjunction with the Angels and Devas of the Nations, guiding the spiritual forces as the others guide the material. The whole earth is divided into special areas,each in the charge of a Master. These areas, consisting of huge countries or even continents, correspond somewhat to "parishes" in the Church organisation. Thus one Adept may be said to be in charge of Europe: another looks after India : and so on. The Adept has all the different grades and forms of evolution to regard—not only humanity, but also the great kingdom of the Angels and Devas, the various classes of nature-spirits, the animals, vegetables and minerals, the elemental kingdoms, and many others of which so far nothing has been heard by mankind. A large part of the work of the Adepts lies at levels far beyond the physical as They are engaged ( Page 320 ) in pouring out their own power, and also the force from the great store filled by the Nirmankayas. It is the karma of the world that it shall have a certain amount of this uplifting force at its service; on account of this, humanity is evolving as a unit, the fact of brotherhood enabling every one to make much more progress, than would be even remotely possible were he standing entirely by himself. The Great White Brotherhood rays out the supply of force from the great reservoir upon all egos, without exception, on the higher mental plane, thus giving the greatest possible assistance to the unfolding of the indwelling life. Whilst an Adept may ray out His force upon enormous numbers of people, running often into many millions simultaneously, yet such is the wonderful quality of this power, which He pours forth, that it adapts itself to each one of these millions, as though he were the only object of its influence, and it appears as though what, for us, would be full attention, were being given to that one. This arises from the fact that the Master's nirvanic or atmic consciousness is a kind of point, which yet includes the entire plane. He can bring that point down through several planes, and spread it out like a kind of bubble. On the outside, of that huge sphere are all the causal bodies, which He is trying to affect, and He , filling the sphere, appears all in all to each individual. In this way, He fills with His life the ideals of millions of people, and is for them respectively the ideal Christ, the ideal Rama, the ideal Krishna, an Angel, or perhaps a spirit guide. In this department of Their work, the Masters frequently take advantage of special occasions, and of places where there is some strong magnetic centre. Where some holy man has lived and died, or where some relic of such a person creates a suitable atmosphere, They take advantage of such conditions , and cause Their own force to radiate along the channels already ( Page 321 )prepared. When some vast assemblage of pilgrims comes together in a receptive attitude, again They take advantage of the occasion , by pouring Their forces out upon the people, through the channels by means of which they have been taught to expect help and blessing. Another example of the methods of work of the Masters at the causal level is afforded in the case of talismans, which a Master may link with His own causal body, so that its influence will last through the ages. This was done with certain physical objects, buried at various points of future importance, by Apollonius of Tyana. The Adept having become one with the Third Aspect of the Logos, manifesting on the plane of atma, His next step is to become one with that Aspect which is represented by the Christ in the bosom of the Father. Later on, it maybe presumed that He will draw ever nearer and nearer to the Deity of the Solar system. When human life is completed, the Perfected Man usually drops his various material bodies, but He retains the power to take up any of them, if ever He should need them in the course of His work. In the majority of cases, one who gains that level no longer needs a physical body. He no longer retains an astral, a mental, or even a causal body, but lives permanently at His highest level. Of those who attain Adeptship, comparatively few remain on our earth as members of the Occult Hierarchy, as will be explained more fully presently. [II ] He may enter on "the Spiritual Period"-a phrase covering unknown meanings, among them probably that of "taking the Sambhogakaya vesture". He retains His manifestation as a triple spirit, and probably can reach down and show Himself in a temporary Augoeides. [ III ] He may become part of that treasure-house of spiritual forces, on which the Agents of the Logos draw for their Work, "taking the Nirmanakaya vesture". The Nirmanakaya appears to preserve His Augoeides, that is, His causal Body, and keeps all His permanent atoms, and therefore has the power to show Himself at whichever level He chooses. The Nirmankayas are Spoken of in The Voice of The Silence as forming a Guardian Wall, which preserves the world from further and far greater misery and sorrow. [IV] He may remain a member of the Occult Hierarchy, which rules and guards the world in which He has reached perfection. [V ] He may pass on to the next Chain, to aid in building up its forms. [VI ] He may enter the splendid Angel or Deva Evolution. [ VII ] He may give Himself to the immediate service of the Logos, to be used by Him in any part of the Solar System: His Servant and Messenger, who lives but to carry out His will, and do His work over the whole of the System which He rules. This is called joining the "Staff". It seems to be considered a very hard path, perhaps the greatest sacrifice open to the Adept, and is therefore as carrying with it great distinction. A member of the General Staff has no physical body, but makes one for Himself by Kriyashakti - the "power to make"—of the matter of the globe to which He is sent. The Staff contains Beings at very different levels, from that of Arhatship upwards. Above the Initiation of the Adept lies the Sixth Initiation, that of Chohan, word which means ( Page 323 )"Lord". The same word is used also for the Heads of Rays Three to Seven. The Ray to which an Adept belongs affects not only His appearance, but also that work that He has to do. [7:17:08 PM] Thuan Thi Do: Master Jupiter. Under the first great group of which the Manu is the Head, can be found two Masters, the Master Jupiter, and the Master Morya. 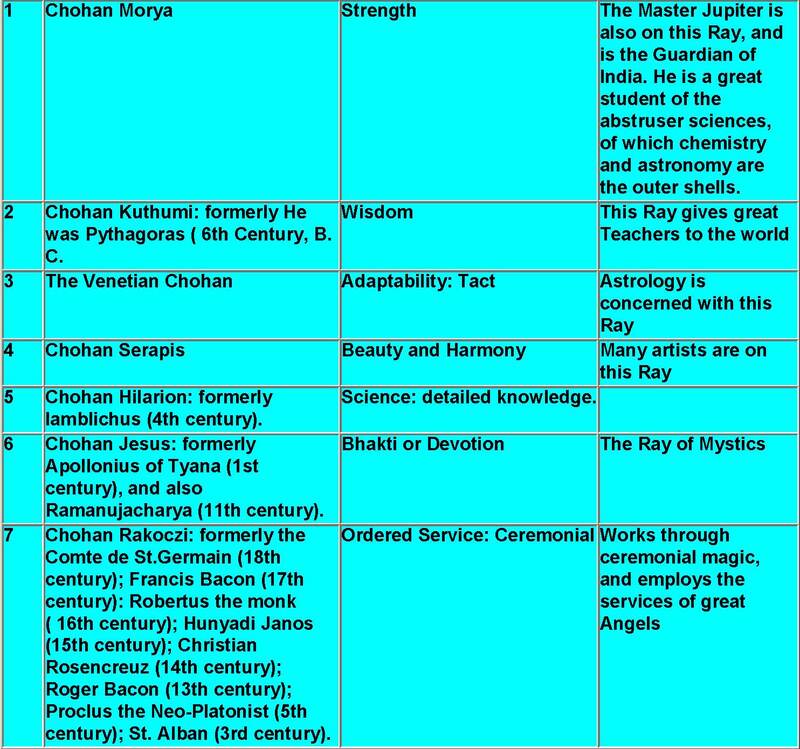 Both of them have taken more than the fifth initiation, and the Master Jupiter, Who is also the Regent of India, is looked up to by all the Lodge of Masters as the oldest among Them. He dwells in the Nilgherry Hills in Southern India, and is not one of the Masters Who [Page 54] usually takes pupils, for He numbers amongst His disciples initiates of high degree and quite a number of Masters. In His hands are the reins of government for India, including a large part of the Northern frontier, and to Him is committed the arduous task of eventually guiding India out of her present chaos and unrest, and of welding her diverse peoples into an ultimate synthesis. The Master Morya, Who is one of the best known of the Eastern adepts, and Who numbers amongst His pupils a large number of Europeans and Americans, is a Rajput Prince, and for many decades held an authoritative position in Indian affairs. [7:57:32 PM] Van Atman: These three are the finite aspects or the reflections on the field of Cosmic Illusion of ATMA, the seventh, the ONE REALITY. [8:26:28 PM] Thuan Thi Do: Everything in the Universe follows analogy. “As above, so below”; Man is the microcosm of the Universe. That which takes place on the spiritual plane repeats itself on the Cosmic plane. Concretion follows the lines of abstraction; corresponding to the highest must be the lowest; the material to the spiritual. Thus, corresponding to the Sephirothal Crown (or upper triad) there are the three elemental Kingdoms, which precede the Mineral (see diagram on p. 277 in Five Years of Theosophy), and which, using the language of the Kabalists, answer in the Cosmic differentiation to the worlds of Form and Matter from the Super-Spiritual to the Archetypal. Now what is a “Monad?” And what relation does it bear to an Atom? The following reply is based upon the explanations given in answer to these questions in the above-cited article: “The Mineral Monad,” written by the author. Vol. 1, Page 178 THE SECRET DOCTRINE. so the Mineral Monad — being at the opposite point of the circle — is also One — and from it proceed the countless physical atoms, which Science is beginning to regard as individualized. Vol. 1, Page 179 THE LUNAR MONADS. Essence” begins to imperceptibly differentiate towards individual consciousness in the Vegetable Kingdom. As the Monads are uncompounded things, as correctly defined by Leibnitz, it is the spiritual essence which vivifies them in their degrees of differentiation, which properly constitutes the Monad — not the atomic aggregation, which is only the vehicle and the substance through which thrill the lower and the higher degrees of intelligence. Mọi vật trong Vũ Trụ đều noi theo qui tắc tương đồng: “Thiên địa vạn vật đồng nhất lý” (“Trên sao dưới vậy”) (“As above, so below”). Con người là một Tiểu thiên địa được cấu tạo rập theo qui mô của Vũ Trụ. Những gì diễn ra trên cõi giới tâm linh, cũng tái diễn lại trên cõi vật chất của Vũ Trụ ngoại tại. Mọi sự biểu lộ cụ thể noi theo những đường lối của thực thể siêu hình; tương ứng với cái cao nhất phải là cái thấp nhất; vật chất đối với tinh thần. Như vậy, có ba loại tinh hoa chất có trước giới kim thạch (1) tương ứng với ba Ngôi Sao Sáng Tạo (Sephiroth Crown) hay là Tam Nguyên Thượng và nếu người ta sử dụng đến ngôn ngữ của những tín đồ Do Thái Bí giáo (Kabalists) trong sự phân hoá vũ trụ, từ cõi thiêng liêng cao siêu đến những cõi Nguyên hình. Chân Thần có một mối tương quan gì với nguyên tử hay phân tử theo khoa học hiện tại. Nó không thể so sánh với cơ phận vị khuẩn trước đây được xếp vào loại trích trùng (infusoria) nhưng nay lại được xem như thảo mộc và xếp vào loại rong rêu. Cũng không phải là monas của phái Ta Bà (Peripatetics). Lẽ tất nhiên, Chân Thần khoáng thạch khác hẳn với Chân Thần con người về thể chất hay thành phần, vì Chân Thần con người không thuộc vật chất và thành phần của nó cũng không thể xác định bằng ký hiệu hoá học và nguyên tố (1). Nói tóm lại, cũng giống như Chân Thần Tâm Linh và Duy Nhất, Đại Đồng Vô Biên, tự tại mà những Tia Sáng hợp thành cái gọi là “Chân Thần Cá Biệt” (“Individual Monads”) của con người, thì Chân Thần khoáng thạch ở tại điểm đối diện của vòng tròn, cũng là Một (One), từ đó xuất phát vô số những nguyên tử vật chất mà khoa học bắt đầu xem như là những vật hữu thể. [8:48:49 PM] Thuan Thi Do: Vol. 1, Page 179 THE LUNAR MONADS.